The school was not open long before the outbreak of WW1. Head Mistress: Miss Helen D. Heatley, M.A. (Lond.). Assistant Mistresses: Miss F. S. Clay; Miss A. H. Craven; Miss M. W. Dyott; Miss M. E. Fletcher; Miss I. A. Irwin, B.A. ; Miss W. M. Kirkman; Miss D. G. Leete, B.Sc. ; Miss S. Luce, B.A. ; Miss N. A. S. O'Connor; Miss M. E. Payton, B.A. ; Miss K. M. Neligan, B.A. ; Miss K. L. Porcher, B.A. ; Miss E. M. Stevenson; Miss E. R. St. C. Tissdall; Miss J. K. Wallis; Miss F. J. Leach, B.Sc. ; Miss E. A. Walton; Miss D. Bailey, L.R.A.M. ; and Miss H. Jenks, L.R.A.M. In 1914 Miss A. M. Baker; and Miss Bexfield joined the staff, followed by Miss C. Buchanan, B.Sc. in 1915. Miss Helen Heatley was well respected and liked by the pupils. She has been described as being sympathetic, kind and helpful and of having great courtesy and consideration for others. She played the important role of getting a girls high school established in the town to rival standards set by the long established Boys' Grammar School. She lived nearby in Parkdale on the Tettenhall Road with her close friend and secretary, Miss Kirkman, and tried to instil lady-like behaviour into the girls, who were expected to dress modestly and behave with impecable manners. They were not allowed to walk down the drive without wearing their hats and gloves. (A school rule that persevered into the 1960s!). It was impressed upon them that they represented the school when seen in uniform. She placed great weight on the importance on the carrying on with school traditions on the outbreak of war, and was always impressing upon the girls that they had a role to play in the war effort. As head mistress she supported any efforts made to raise money for charities or help the local community. The girls made lavender bags, and collected sheep's wool which was used to make knitted squares. They were dyed in a wide range of colours and sewn together to make blankets. Other items they made included book markers, wall paper bead necklaces, and soft cloth dolls. 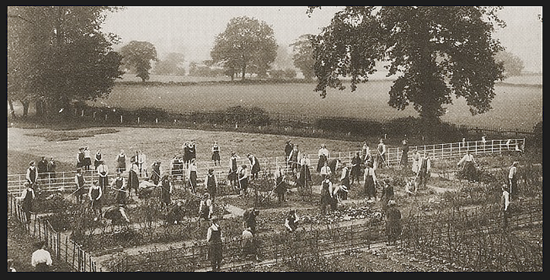 Allotments were also set up to produce fruit and vegetables for use in the school's kitchens. On 11th November, 1918, Miss Heatley summoned the whole school to the hall to inform them that the war had ended, and the armistice had been signed. Everyone was then sent home for the rest of the day.